The Russian State Library (RSL) is the largest library in Russia, the second largest library in the world. It was founded in 1862 and was a part of the Moscow Public and Rumyantsev Museums. From the moment of foundation the Library has been receiving the legal deposit copies of all publications released in Russia. On January 24, 1924, it was renamed as the v. I. Lenin Russian Library. On February 6, 1925, it was transformed into the v. I. Lenin State Library of the USSR, and since January 22, 1992, it is the Russian State Library. Now the Russian State Library stores in its holdings more than 47 million books, documents and artefacts. More than 800 thousand people visit the library annually and about 100 thousand new library tickets are issued. There are 36 reading rooms in the RSL, where more than one and a half thousand people can work at the same time. Any citizen of Russia or other state above 14 years old can become a user of the Library. It is important for the Library not only to enlarge its collections, but also to make them as accessible as possible, paying attention to the preservation of rare and valuable editions. Digitization and placement of materials in the RSL electronic library solve these tasks. More than 90% of dissertation abstracts, early printed books, documents from the Cartographic collection and the Universal collection, and more than 80% of the Music collection are in the public domain. Access to copyrighted documents is only possible from the Library premises. At the end of 2014 by the decision of the Ministry of Culture of the Russian Federation the Russian State Library was appointed the operator of the National Electronic Library (NEL). NEL is a modern project aimed at free access of readers to the collections of key Russian libraries through the integrated portal and search system. Since January 2017 the RSL started to receive electronic legal deposit copies of printed publications and dissertation theses. The Library is developing and looking for new forms of interaction with the reader. The best and the most interesting of the RSL collections is demonstrated at exhibitions. In 2016 the Russian State Library opened the new museum space for major exhibitions Ivanovsky Hall. Each exposition is accompanied by lecture tour and excursion program. You can also have a tour to the Book Depository, Pashkov House, Book Museum and walk through the premises of the main building. On traditional events of LibraryNight, LibraryDay and Open Doors Day experts and everyone are welcome to acquaint with the work of the Library. 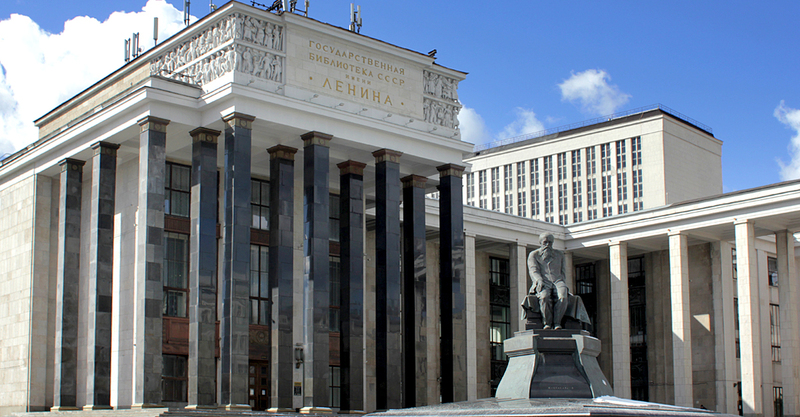 The Annual Public Report demonstrates in detail how the Russian State Library is changing. The Russian State Library comprises the unique domestic and foreign collections in 367 languages of the world. The size of all holdings exceeds 46 million items, and about three million of them are particularly valuable editions and other documents. The General Digital Catalogue provides bibliographic records on all types of items, including articles, published in Russian and other languages in various media at different periods of times. Access to the General Digital Catalogue of RSL is open for free to all Internet users. You can search through the whole catalogue or limit your search to the following sub-catalogues for a particular category of items. Employees of the Virtual Information Service will answer your questions about the work of the Library and help in selection of literature. Russian state library is open from 9:00 to 20:00 Monday to Saturday and closed on Sunday. RSL is also closed on the last Monday of the month. Every citizen of the Russian Federation or another country from the age of 14 can join the Library and become a Library reader. RSL departments and services are located at six different addresses. Every citizen of the Russian Federation or another country from the age of 14 can join the Library and get a Library card to use the stock of the library through its 37 reading rooms. RSL ’Pashkov Dom’ Publishing started in 1998 as a legal successor of the Publishing department of the Library. While developing its tradition to publish literature on Library Sciences it has expanded its publishing portfolio to facsimile and reprinted rarities, publications of yet unpublished manuscripts and archive documents. The Russian State Library (FSI) is carrying on publishing a special number of journals and magazines on Arts, Librarianship, Bibliography, Bibliology etc. Journals and magazines are distributed as subscription editions.